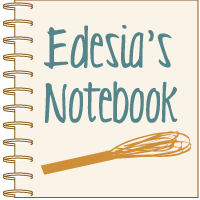 This is a recipe I have been making for several years now, but have never blogged about until now. It is a yummy buttery pasta sauce that includes all of the flavor and "essence" of the tomato, but without the chunky consistency. I got it off the side of a box of some kind of pasta or something, but I can't remember now exactly what. Put stock and tomatoes in a saucepan over high heat. Cook until liquid has reduced by half, breaking up the tomatoes with a spoon as they cook. Remove from heat and pour the tomato mixture through a fine mesh sieve, using a rubber scraper to get all the liquid out. Discard tomato solids and put liquid back into saucepan. Turn heat to low and add butter. When butter has melted, whisk briskly to completely incorporate it into the tomato liquid. Serve immediately over hot pasta. Makes enough for 1 lb. of pasta. I consider this a summertime dish because I would not even consider making this with grocery store "tomatoes". Yes, I used quotes because I don't even consider those pinky-orangey things in the grocery store tomatoes. They have no flavor and therefore would make a disaster out of this sauce. You have to have fresh garden or farmer's market tomatoes to make this. Remember to scrape off the bottom of your sieve because a lot of tomato goodness hangs there when you are straining! This is a very thin sauce. It will run all over your plate. I have considered adding some cornstarch to it to thicken it up a bit, but haven't tried it yet. The picture above is this sauce on whole wheat gnocchi. 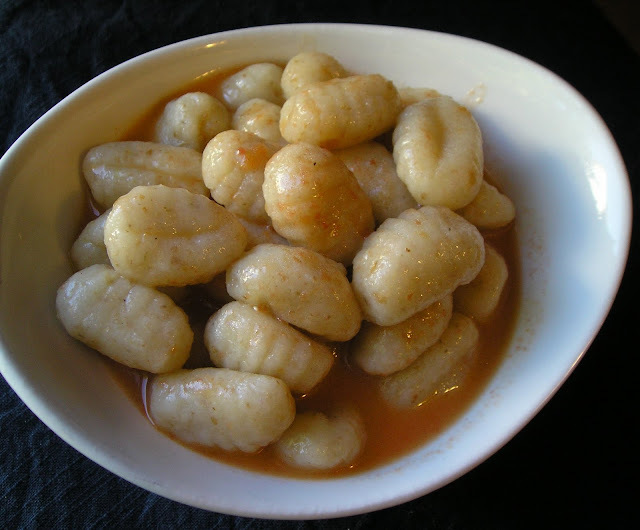 I think it's best on gnocchi because the little potato pillows soak up all the sauce. So good. But I also really like it on those refrigerated ravoilis and tortellinis too. If you have an abundance of fresh tomatoes from your garden and aren't sure what to do with them all, give this sauce a try.